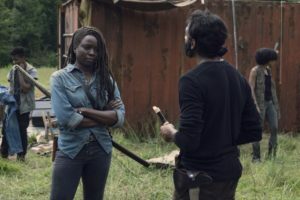 This week’s chapter of The Walking Dead set things up for a major confrontation in the mid-season finale and answered a few more questions about the new world, particularly about Maggie’s disappearance. 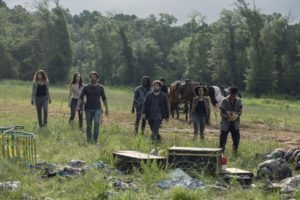 We got confirmation that Maggie is not dead but just out of the picture for some reason. She and baby Hershel are off somewhere with Georgie and, another mystery, Michonne only just found out. Not much else is revealed and it would be lame to answer all our questions in one episode. There will be some big changes by next week, that’s for sure. We also catch up with the folks at the Hilltop where Jesus is currently the reluctant ruler, elected by the people but fulfilling what he believes to be a temporary responsibility. He has secret sparring sessions with Aaron. The episode also gives us time to get to know the new survivors, who are being escorted by Michonne only part of the way to the Hilltop. They share some backstory and they also have a chance to showcase their fighting skills. With the ever-expanding cast of The Walking Dead, it is not always easy to balance the stories of every character introduced but I confess that this new group is growing on me. They seem to be interesting individuals with fascinating back-stories and they are capable fighters (using weapons like a bow and arrow and a slingshot) so they would not be unwelcome in any community. In Michonne’s haste and paranoia, she accidentally hacks a precious Stradivarius violin, to Luke’s despair. The item gives the episode its title and also gives a chance for him to talk about what constitutes humanity, and how “cultured” humans surpassed their neanderthal ancestors. It’s not the most original idea on the show and definitely a concept that has been tackled by other characters, but still an interesting point to be made. 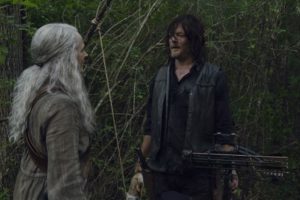 Daryl and Carol also spend some quality time together, the latter trying to convince him to stop living like a hermit and to become a mentor of sorts to young Henry. Even if Carol is with Ezekiel now, it’s great to see that she and Daryl still maintain such a close relationship. She is one of the few people he can open up to and she finds out that he is still searching for Rick’s body. Keep the faith, Daryl. There is a minor but unnecessary scare where walkers try to attack Daryl and his dog and Henry comes to their rescue. But this was just to fill the time. Lately, the stakes on The Walking Dead are astonishingly low for a zombie apocalypse show. And now, we really care about this nameless dog, probably more than about some of the other human characters, no matter how long they have been on the show. Rosita makes her way back to the Hilltop but Eugene is still missing. Jesus sets out to rescue him and will probably cross paths with the Whisperers by next week’s mid-season finale. There’s a huge conflict ahead and everyone will need to join forces if they are to face this newest threat.